Keeping the hot water flowing in your home is important because so many of your daily tasks depend on it. 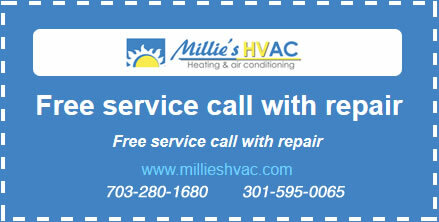 So whether your water heater is brand new or has been through quite a few seasons with you, professional Ashburn water heater maintenance service from Millie’s Heating & Air Conditioning is just what it needs to keep working efficiently and effectively. Our technicians can work on all types of water heaters, including tankless models, and we will be glad to maintain yours for you whether we installed it initially or not. We have been providing trusted water heater services in the Ashburn area for many years, and we would be glad to add you to our list of satisfied customers. A well maintained water heater will save you money in several ways. First of all, it will run more efficiently, keeping your total energy usage down and your bill lower. It will also break down less frequently because regular maintenance visits allow our technicians to find and replace parts that are breaking or worn out before they have a chance to cause trouble. Nothing can guarantee that you never need to call for emergency repairs, but keeping up with regular water heater maintenance is the best way to keep those occasions to a minimum. Maintaining your water heater on a regular basis also helps it to last longer, and that means you get more for your initial investment and can defer the cost of replacement for longer. And, of course, a well maintained water heater simply works better, so you can enjoy hot water all over your home whenever you need it. Our technicians have extensive experience will all types of water heaters, so you can be sure that the work we do for you will be high quality across the board. We also only use quality parts, materials and equipment on all of our projects, and we will let you know what we are doing at all times so you know what to expect. Millie’s professional water heater maintenance services can be scheduled for any time that suits your schedule, and we are always available to answer questions or make an appointment. So do not hesitate to call us today to learn how we can help keep your water heater working properly over the long term.